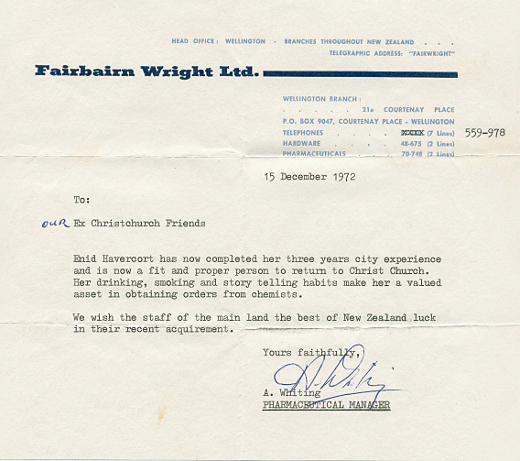 Courtesy of the pharmaceutical manager of now-defunct importing firm Fairbairn Wright comes an amusing letter, written in 1972 to announce the interoffice transfer of a member of staff by the name of Enid Havercort. Following three years of head office experience in the city of Wellington, New Zealand, Enid was now ready to begin her career and clearly equipped to get the most from clients. Transcript follows. Huge thanks to Nixz for the letter. Enid Havercort has now completed her three years city experience and is now a fit and proper person to return to Christ Church. Her drinking, smoking and story telling habits make her a valued asset in obtaining orders from chemists. We wish staff of the main land the best of New Zealand luck in their recent acquirement.